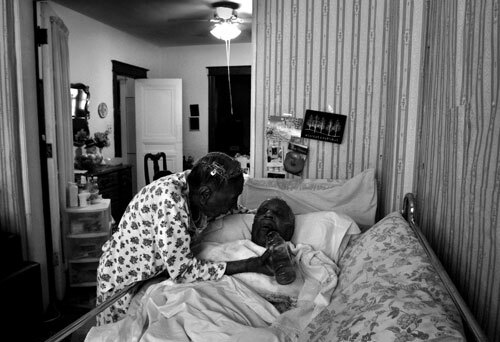 Clarice "Classie" Morant, 104 years old, displayed a poignantly tender unconditional devotion for her sister Rozzie Laney. She had been caregiver for the bedridden 92-year-old victim of Alzheimer's for twenty years. Rozzie had withered to a state of complete dependency. Her niece Gloria called it, "No greater love." She had assistance from a DC health aide agency but remained fiercely independent, refusing any thought of a nursing home for her beloved sibling's care. Rozzie died New Year's eve at their home embraced by love, as Classie wished. That night she curled up on Rozzie's bed to feel closer to her departed sister. Her job as caregiver done, she slept there until five months later she lay her own head down in peace and quietly passed away. "God has given me a good life. Lived a long time. But when I go, I hope I go like Roz. Just go on to sleep." As a young woman, Classie was unable to vote and has seen a century of changes in America. While the debate swirls about health care reform and the global economy collapsing she managed to hold tight to core values. She took care of her own.